it Has been a long time since the guardian of the crypt, he stopped to tell us exciting stories of suspense and terror. Fortunately, after several failed attempts to return to the screens of the mythical ‘Tales from the crypt’, EC Comics return with a series on ‘Weird Fantasy’. Hivemind has just announced a partnership with William M. Gaines Agent, Inc., the owners of EC Comics, to make number of projects for film and television based on their works and on the life of its editor, the controversial William M. Gaines. One of the first productions of the association shall be ‘Weird Fantasy’, a new television series inspired by the subversive comic series of science fiction and fantasy combined with elements such as equality, nuclear disarmament, or the preservation of ecological, creating some of the stories of comic’s most controversial comics. in Addition to the stories of fantasy, you will also see the light a feature film based on the life of Gaines, who defied the rigid moral code of the united States of the fifties. He was so good at it that his books were burnt in the streets after the amazing success of EC Comics. The film will continue the transformation of Gaines entrepreneur publishing of New York to a hero of the counterculture, and champion of the First Amendment. 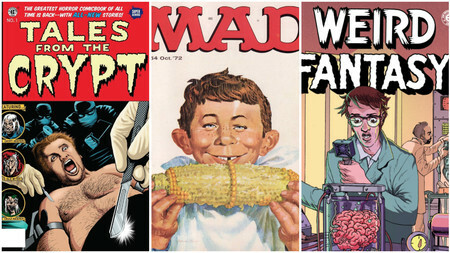 The news ‘Weird Fantasy’: the science-fiction EC Comics returns to the screen a quarter of a century after ‘Tales from the crypt’ was originally published in Espinof by Kiko Vega .